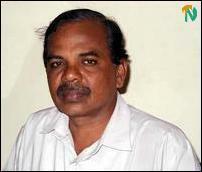 The EI unanimously adopted the resolution on Sri Lanka submitted by the President of the Ceylon Tamil Teachers Union (CTTU) Mr.S.Thandauthapani who represented his union at the conference. 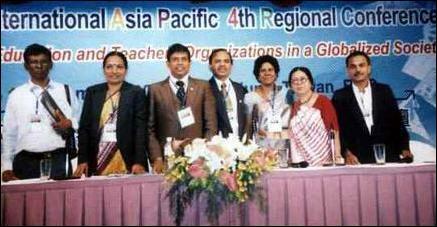 The main theme of the conference was "The challenges to education and teachers’ organizations in globalized society." "The CTTU wishes to submit the following resolution to be adopted at the EI's Fourth Asia and Pacific Regional Conference. The two-decade-old-war was brought to a halt with the ceasefire agreement signed by the Prime Minister Mr.Ranil Wickremasinghe and the Liberation Tigers of Tamil Eelam leader on February 22 last year. Since the signing of the ceasefire agreement, there is peace in the northeast province and peace talks were in progress with the facilitation of Norway and with full support of the international community. But now as a result of the power struggle between the Executive Presidency and the ruling United national Front government led by the Prime Minister Mr.Ranil Wickremasinghe, Norway has suspended its facilitator’s role and there is a threat of war. To hand over all schools now occupied by the Sri Lanka Army in the high security zones of the northeast province enabling the provincial education ministry to recommence those schools thus providing schooling facilities to internally displaced children. The CTTU President Mr.Thandayuthapani, who is also the Principal of Trincomalee leading national school, Sri Koneswara Hindu College submitted a report at the EI Asia and Pacific Regional Conference on the current education situation in the northeast province. He said the drop out rate of students in the northeast province is about 15 %, which is four times more than the rest of the country and more than 60 thousand children have never been enrolled into the school system. About 750 schools had been damaged due to bombing and shelling. Tamil medium schools in the NEP face acute shortage of more than ten thousand teachers whereas the other seven provinces in the south has an excess of more than fourteen thousand Sinhala medium teachers. Mr.Thandayuthapani was elected to the fifteen- member EI Asia Pacific Region Committee (APRC) to represent the SAAR organization. This was the first time a representative of the CTTU was elected to EI Asia Pacific Region Committee by the teacher trade union organizations of the SAARC group. Representatives from ASEAN, Pacific and North Asia were also elected to the APRC. The Education International represents worldwide about 26 million members and the EI’s Asia Pacific Region represents more than 9 million members. The countries represented at the 4th Asia Pacific Regional Conference were Australia, Afghanistan, Bangaladesh, Brunei, Cambodia, Hong Kong, Cook Island, East Timor, Fiji, India, Indonesia, Japan, Kiribati, Korea, Krygystan, Kazakhstan, Malaysia, Mongolia, Nepal, New Caledonia, New Zealand, Pakistan, Papua New Guinea, Philippine, Singapore, Solomon Islands, Sri Lanka, Taiwan, Thailand, Tonga, Tuvalu, Uzbekistan, Vanuatu and Western Samoa.